The Young Life Leader Blog: Graduating College Soon ... Now What? Graduating College Soon ... Now What? If you're preparing to graduate from college, odds are, you're starting to get the million-dollar question, "What are you doing when you graduate?" Some of the best advice I ever received was "Take your 20's and be a sponge.You have the rest of your life to make money. After college, find wise people and learn from them." If you saw yesterday's post, you know I highly recommend working at The Dale House Project. If that's not the right fit for you, I can't think of a better opportunity than The Greensboro Fellows program. The director and associate director are both dear friends of mine and spending a year with them would be worth its weight in gold! 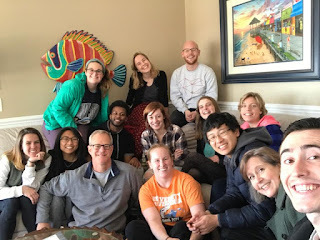 Experience deep community and friendship after college? Gain experience working in the marketplace? Experience working in a church? Stay involved with Young Life? Experience a mission trip to Africa? For many college students, it's a big jump from earning a degree to actually applying it to a career. Dream jobs don't happen overnight - and that's if you even know what your dream job is. That's where the Greensboro Fellows Program comes in. It is a 9-month (September – May) program for those who desire and are committed to the pursuit of spiritual, personal, and professional growth. It is intended and geared towards young adults who have recently finished college. The curriculum, planned excursions, paid internships, volunteer work, and community all work together to inspire and empower you to be leaders wherever God calls you. This program is based out of Greensboro, North Carolina, and serves as the ideal springboard for entering into professional careers and adult life. It is a part of the church where I am on staff and also works closely with Young Life. If you are interested in learning more about this program, or applying to be a part of the 2018-2019 program year, you can visit www.greensborofellows.com, watch this video, or email the director, Dodd Drake. "The Greensboro Fellows Program is far more than a transition out of college and into the adult world. The Fellows Program is a safe place to call home and a warm invitation to walk alongside family. You will be encouraged to grow more deeply than you thought possible, while simultaneously developing your professional skill set and your personal and spiritual gifts. You will be taught, nurtured, equipped and then sent out to build His kingdom."